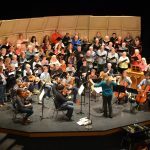 Tuesday evenings, September through May, the Madrona Room at the Orcas Center overflows with song as Orcas Choral Society rehearses for its winter and spring concerts. 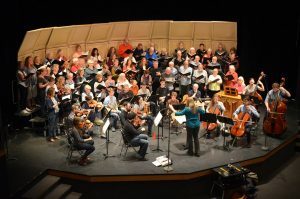 A volunteer community choir ranging at any time from 50 to 70 voices, Orcas Choral Society regularly brings world-class choral music to Orcas and gives islanders a chance to sing it. It’s been an Orcas institution since the 1970s and is growing strong. 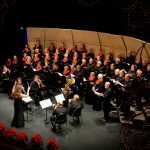 Orcas Choral Society sings a wide range of vocal works from Christmas carols to Mozart’s Requiem and Bach’s B-Minor Mass. 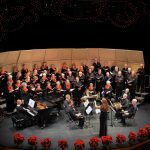 In 2018, the choir performed works by world-famous composer Morten Lauridsen, who also accompanied. Lauridsen composes many of his pieces on Waldron Island. In 2016, the group performed the world premiere of an 1826 mass by Czech composer Alois Storch, which had been handed down to oboist and Orcas resident Laila Storch, mother of Orcas Island Chamber Music Festival Artistic Director Aloysia Friedmann. In 2007, Orcas Choral Society commissioned and premiered a choral piece entitled The Rose, by Stephen Chatman. Its words by Theodore Roethke were written following the poet’s visit to the San Juan Islands. Orcas Choral Society frequently performs with other Orcas musicians, from the Turtleback Brass to Martin Lund to the Orcas Boy Choir. And, it brings in regional musicians to the islands, notably the Skyros Quartet, for pieces that require a full orchestra. 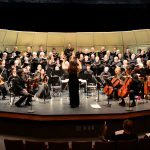 Choral Society regularly performs in the annual MAG (Music Advocacy Group) concerts, supporting music instruction in Orcas Island public schools. Orcas music teacher Catherine Pederson and pianist Louellen McCoy established Orcas Choral Society in 1977. 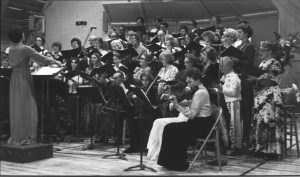 The nascent group performed selections from The Messiah in 1977 and gave its first general concert in 1978. Catherine Pederson directed Orcas Choral Society for 33 years, retiring in 2010. Organist and choral conductor Roger Sherman guided the group for six years until he retired in 2016. Marianne Lewis, also an organist and choral conductor, is Choral Society’s third artistic director. McCoy, Orcas Choral Society accompanist, retired in 2002.. Marianne Lewis, Terri Triplett and Patricia Johnson have filled the accompanist role since. Catherine Pederson is Founding Artistic Director Emeritus of Orcas Choral Society. 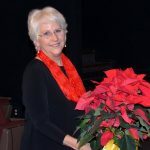 As its Director for 33 years, she created a community of island singers who love music, are steadfast in friendship, and are committed to being a meaningful part of the community. Pederson is a founding member of the Orcas Island Chamber Music Festival Board and of the Music Advocacy Group (MAG). She maintains a private piano studio on Orcas. Before moving to Orcas, Pederson served as organist and children’s choir director at St. Thomas Episcopal and Central Lutheran churches in Eugene, Oregon. She taught middle and high school music in Eugene and on Orcas, and holds degrees from the University of Oregon and Pacific Lutheran University. She has participated in numerous choral workshops and festivals in the U.S., Canada, the Netherlands, and Cambridge, England. 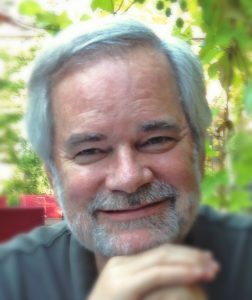 Roger W. Sherman directed Orcas Choral Society from 2010-2016. Associate Organist Emeritus of St. Mark’s Cathedral in Seattle, he has served as Executive Director of the Westfield Center for historic keyboard instruments. He produces and hosts the popular “Organ Loft” radio program. Sherman owns and operates The Gothic Catalog, based on Orcas Island, which records choral and organ concerts worldwide. He attended Oberlin Conservatory of Music and has composed five published choral works. In the 1970s, Sherman was Director of Music for St. Paul’s Episcopal Church in Milwaukee, Wisc. and taught organ and harpsichord at the Wisconsin Conservatory of Music. Marianne Lewis, organist, harpsichordist and choral director, has been Artistic Director and conductor of Orcas Choral Society since 2016. She is also choirmaster and organist at Emmanuel Episcopal Church in Eastsound. 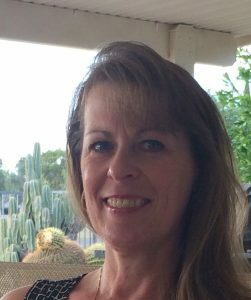 She previously served as choir director and organist at St. James Lutheran Church, Portland, and Milwaukie Lutheran Church in Oregon. Lewis also accompanied Portland’s Oregon Repertory Singers. She holds music degrees from Lewis and Clark College and University of Oregon.